There has been considerable discussion about the whether the media hyped the recent Harvard Diabetes stem cell paper (see top 10 takeaways of that paper) . I believe that this was greatly hyped. This Harvard publication reported production of insulin-secreting cells from human embryonic stem cells (hESC). Newspapers around the world widely exaggerated the potential impact of this paper. They often used the word “cure”. 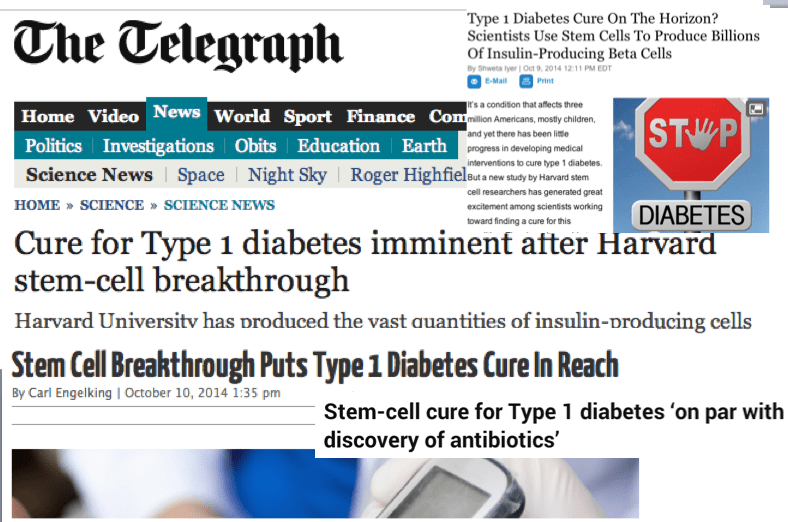 Perhaps the worst offender was the Telegraph with their headline “Cure for Type 1 diabetes imminent after Harvard stem-cell breakthrough“. I’m not even going link to the article because that headline was so dumb. Many other papers also used “cure” in their article titles (see above). Harvard itself also issued a piece mentioning how this work brought a ‘cure” closer in the article subtitle. I have tremendous respect for the Harvard researchers on this team and this paper is very important, but this situation got totally out of control. The use of the word “cure” is something that should be carefully deliberated not just for Diabetes, but for any disease. We all want cures for various diseases, but a cure for anything is a high hurdle. It means that the disease is gone and not coming back. Ever. I’m not a Diabetes expert, but my understanding is that in fact there may be no such thing as a cure for Diabetes. Even with a very effective treatment the patient would still have Diabetes. They would still need blood sugar monitoring. Their immune system would still be active against pancreatic cells. They may need insulin intermittently. Perhaps one could argue that an “effective cure” might even be possible via stem cell-based technology in the form of life-long blood sugar control in the general absence of any other treatment. Again, that wonderful achievement seems at best a decade or more from where we are today. The more careful word to use is “treatment”. Still, an effective treatment would be incredibly exciting. It doesn’t have to be a total cure to be a game-changer. What’s the harm in loosely using the word “cure” as something coming soon? It falsely raises hopes and expectations of patients and others. Saying a “cure” is coming soon is hype. There is a fine line between maintaining appropriate energy and enthusiasm with the language that one uses and going too far. I believe in this case that things crossed that line to hype. I am a little more optimistic, this article sounds more optimistic. I keep fingers crossed and hope these trials will work. If people won´t need insulin anymore after this trial, I think they would be cured and this would be a great step for stem cell research. Unfortunately hyping is an effective technique for getting some superficial researches spreading out as solid discoveries and, more sadly, a successful approach for attracting money into some eventually useless research areas.